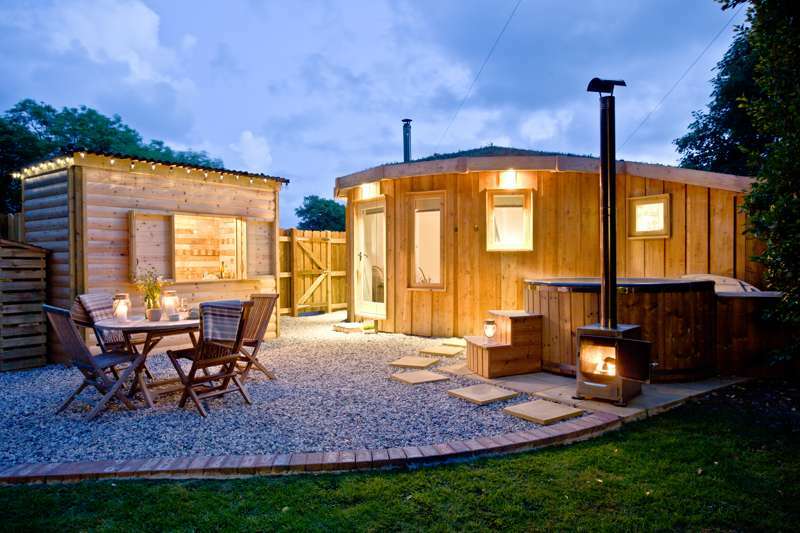 The south-westerly county of Cornwall has some of the best glamping sites in the UK, each offering their own particular brand of Cornish glamping. 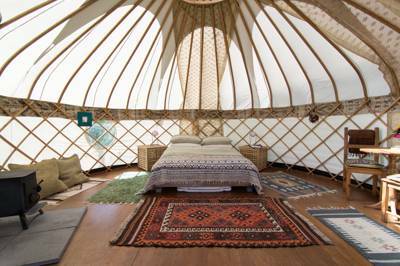 Expect laid-back beach retreats, eco-friendly sites and farm-based glamping getaways as well as a range of accommodation options – from bell tents and yurts to gypsy caravans and shepherd’s huts. 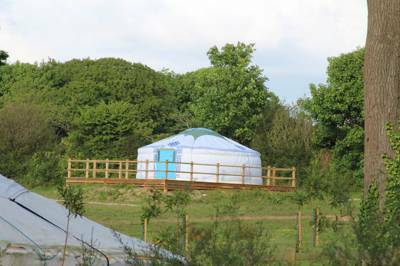 A large traditional yurt which sleeps up to 6 people in one kingsize bed and two double beds, and can accommodate a maximum of two dogs. 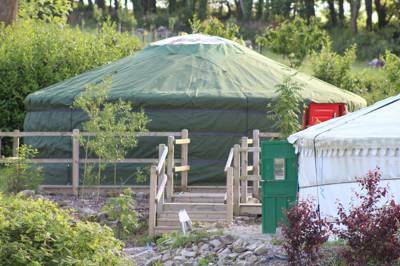 The traditional (standard) yurt is a large yurt with one king size bed and two double beds, sleeping up to six people. So cute everyone is immediately drawn to peep in! 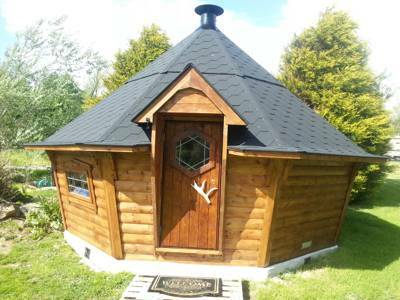 With twinkling fairy lights and a central fire for cooking this wooden lodge is cosy and provides total luxury, with a your own exclusive en-suite pod providing hot water, a sink and a flushing toilet. 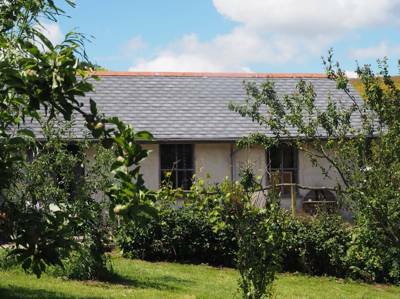 This is a fully-furnished, five metre Lotus Belle Tent, sleeping four, with a wood burner and annex kitchen which is fully equipped for a self-catering stay, situated in a Designated Area of Outstanding Beauty. This is a fully-furnished five-metre Lotus Belle Tent sleeping four, with a wood burner and annex kitchen fully-equipped for a self-catering stay, situated in a Designated Area of Outstanding Beauty. 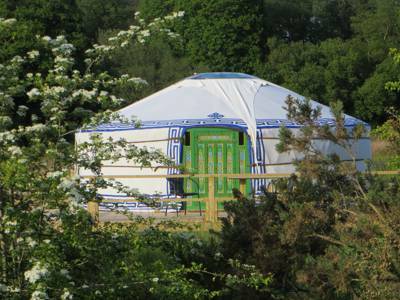 Our spacious 18ft Mongolian-style yurts sleep up to 5 people. They each their own unique character and are furnished with sumptuous feather duvets, beautiful linen and unique quilts. Each yurt has it's own wood burning stove and authentic fire pit. A kitchen is shared between two yurts with plenty of equipment for you to prepare simple meals. 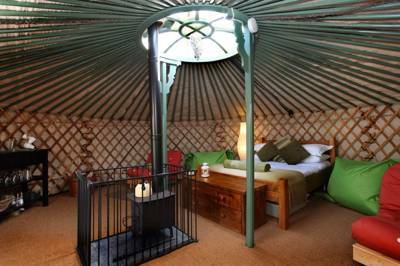 A beautiful yurt can sleep two people, in a very quiet corner of its own field, with a double bed and wood burning stove. 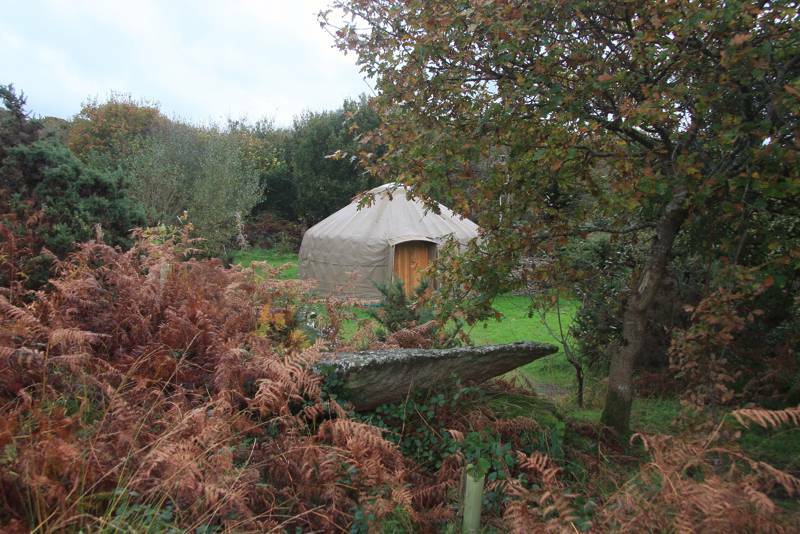 This is our most secluded yurt popular with couples looking for a quiet retreat. Sleeps up to four. 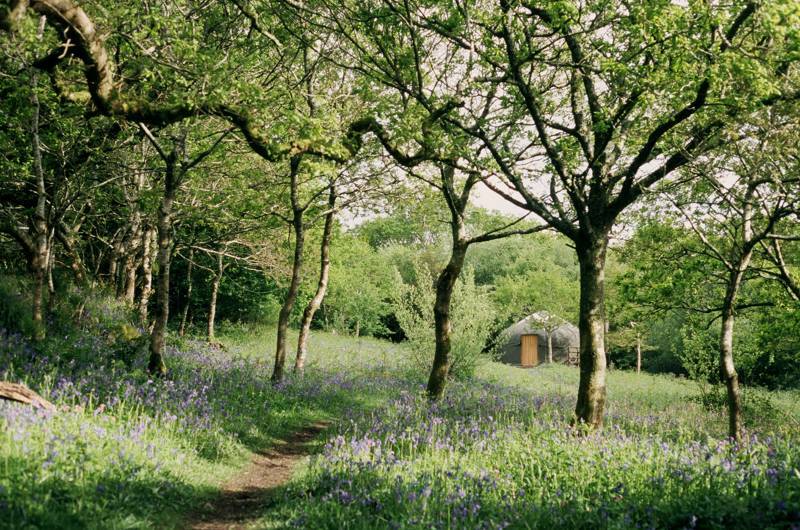 This our most sheltered yurt, set up in a clearing , it is ideal for young families or couples, surrounded by twisted oak trees and hazel coppice. 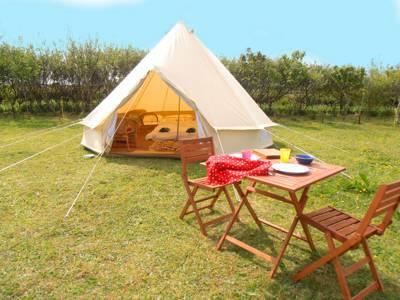 Fully-furnished Bell tent to hire on the beautiful West Cornwall coast. The Bell tent has its own, independent area – a whopping 50m by 50m, basically a field for yourself – follow trails into the trees and explore protected wildlife habitats straight from your tent. 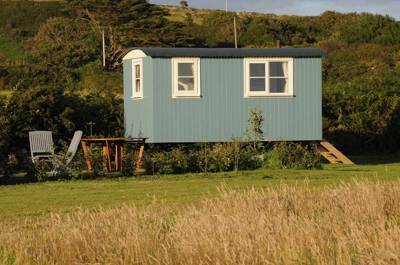 A beautiful gypsy caravan located on it's own space (15m by 15m) on the beautiful West Cornwall coast. Pearl offers a detached and exclusive kitchen area, with all necessary equipment to cook your meals. Follow trails into the trees and explore protected wildlife habitats straight from your accommodation. 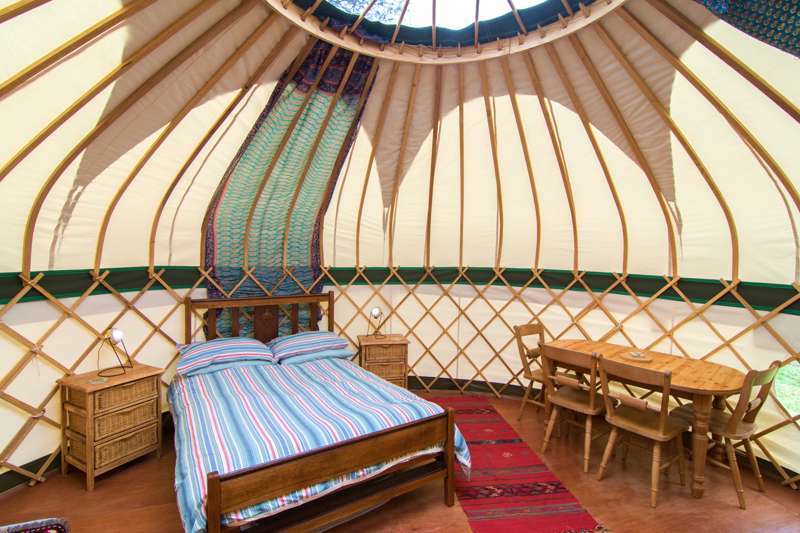 This gorgeous, spacious 21ft yurt is set in the area closer to the facilities. NB The main bed is already fully made up. This gorgeous, spacious 19ft yurt is secluded beyond the stream. NB the main bed is already fully made up. 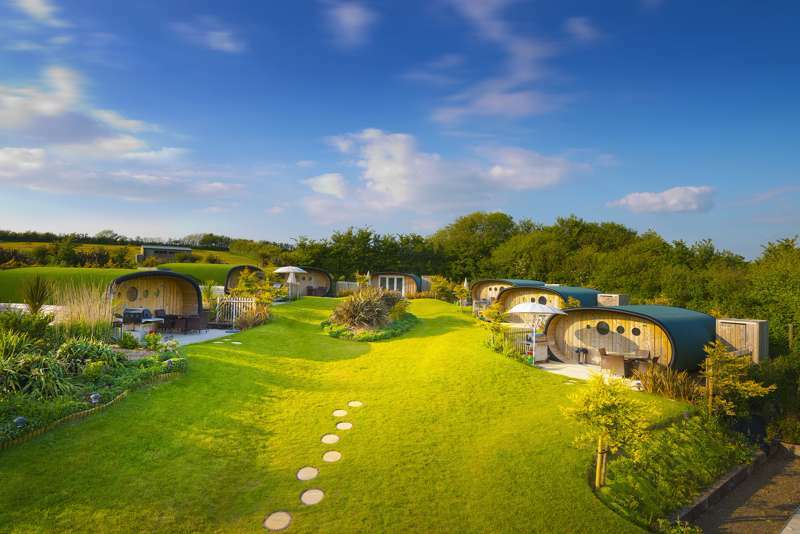 If you’re looking to go glamping in Cornwall then you have a tough choice on your hands, as it has some of the best glamping sites in the UK. 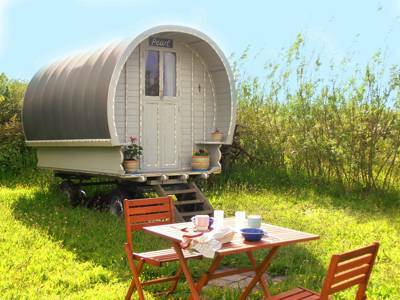 Cornwall has long been known for its campsites and now glamping in the south-west has really taken off too. 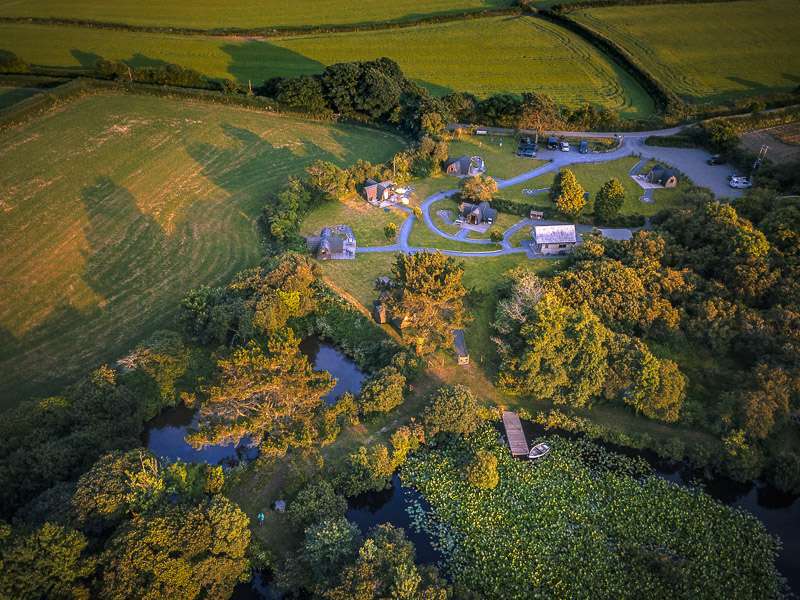 In fact, many established Cornish campsites now offer glamping accommodation alongside their regular camping pitches, allowing you to take advantage of the great facilities while still having the classic outdoor experience. 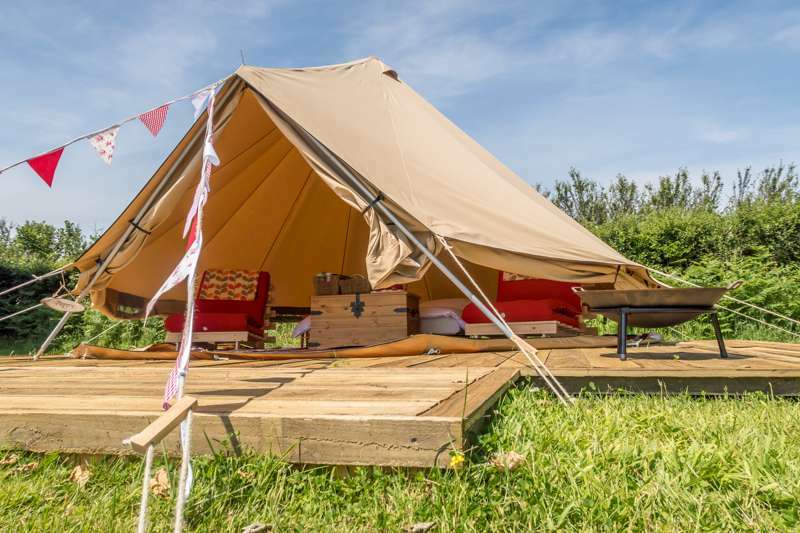 Meanwhile, there are plenty of stand-along glamping sites that offer an air of exclusivity, more private space, luxury bathrooms, hot tubs and all the bells and whistles of a truly luxurious glamping stay. 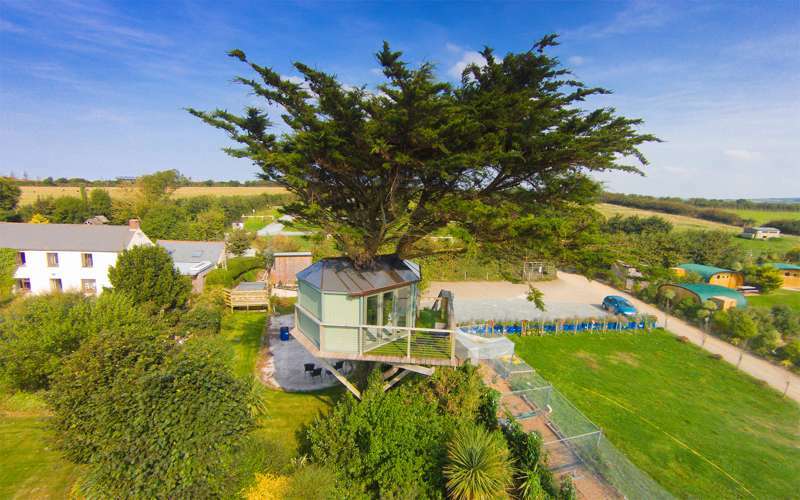 It’s not hard to understand why glamping in Cornwall has become so popular. England’s most south-westerly county has always been a popular holiday destination, with the beautiful beaches and dramatic cliffs on its 300 miles of coastline providing the main draw. Add in the stunning countryside, moors, quaint fishing villages and the fresh food that such resources produce, and you have the recipe for holiday heaven – assuming the British weather plays ball of course! And that’s one of the big reasons why glamping has the edge over traditional camping: your accommodation is likely to be more weatherproof than a tent you pitch yourself – particularly pods, shepherd’s huts and hard-topped structures – plus, of course, you won’t have to pitch the place when you arrive – come rain or shine as someone else will have done the hard work for you! The level of luxury in Cornwall varies from place to place. 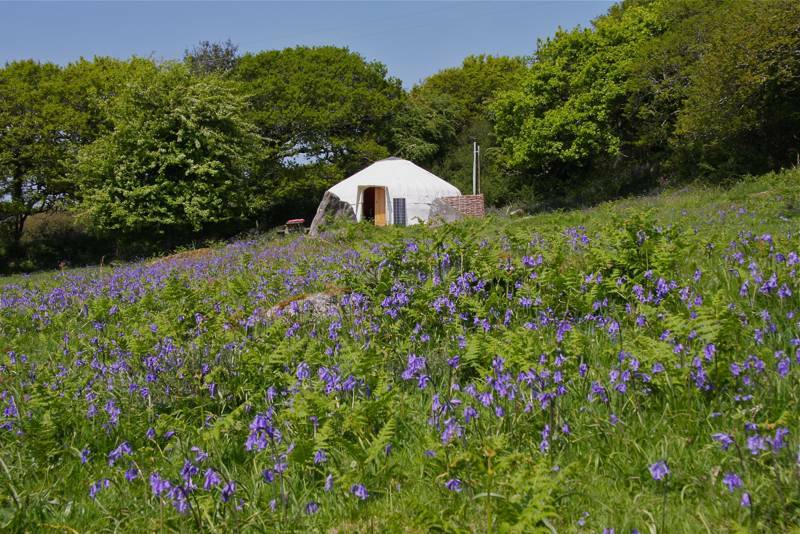 You can choose from Cornish glampsites where there are simply-furnished bell tents to more permanent and spacious fully-furnished yurts or, if you prefer something yet more solid, you can choose a glamping site in Cornwall with a shepherd’s hut, gypsy caravan or even a straw-bale studio. Cornwall has got them all. But how to choose? 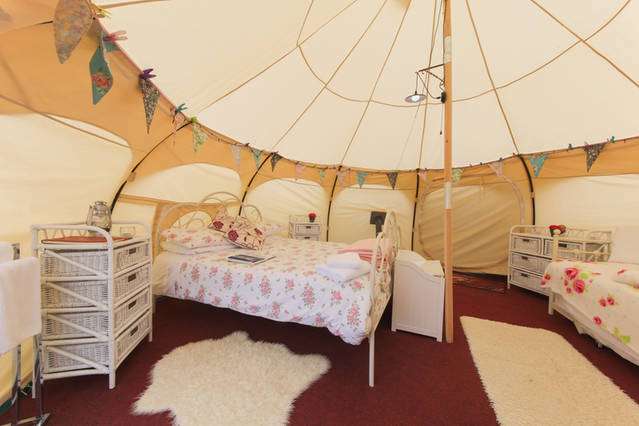 Bell tents tend to offer a great-value glamping option and give you a real camping experience but without the hassle of having to pitching the tent yourself. 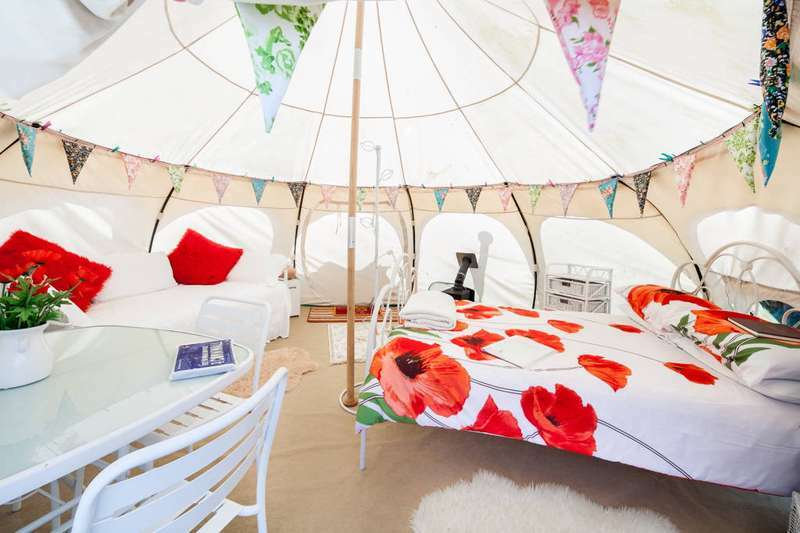 A bell tent holiday in Cornwall is a good option if you’re planning your glamping trip for the summer when the weather is warmer (fingers crossed) and sleeping under canvas is a joy, keeping you close to the great outdoors and keeping the budget low. 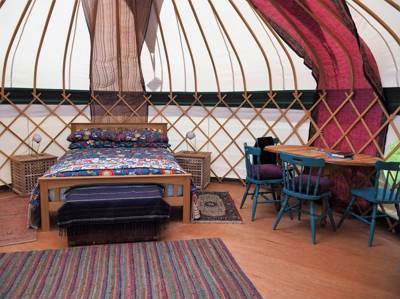 Yurts tend to offer more space and more headroom, which means they can sometimes have more furniture and furnishings than a bell tent. These Mongolian-style abodes pretty much always have a wood-burning stove and can be insulated, so provide a sturdier, roomier home-from-home with protection from the elements. Shepherd’s huts, gypsy caravans and huts and cabins range from the basic to the luxurious but are usually a comfortable option – protecting glampers from the elements and offering a real bed, proper mattress and, usually, with bed linen included too. Many are set up with everything you need (literally including the kitchen sink) and some have en suite facilities, too, for truly self-contained glamping – but do make sure you check what’s provided before you book. 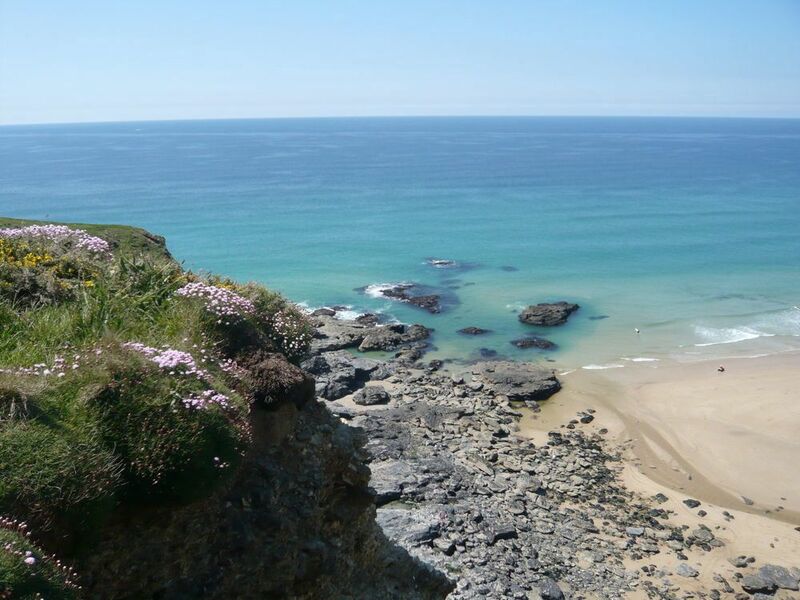 The magnificent coast of Cornwall is probably the county’s biggest attraction and for many people the best glamping site would be one within easy reach of the beach. But which beach you’ll want to head to will be dependent on whether it’s a bucket and spade, a surfboard or a dog you’re taking with you. 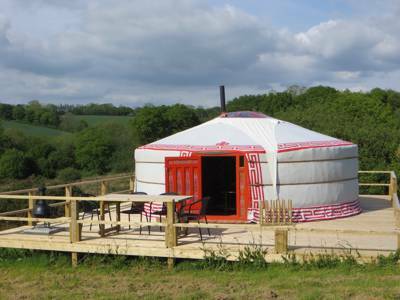 There are glamping sites near the Cornish coast on all sides of the county so whether you want to go glamping and surfing near Newquay, Bude or Polzeath on the north Cornwall coast or are looking for beach-side glamping sites in south Cornwall, you should find something to suit in our collection of glamping hot spots. 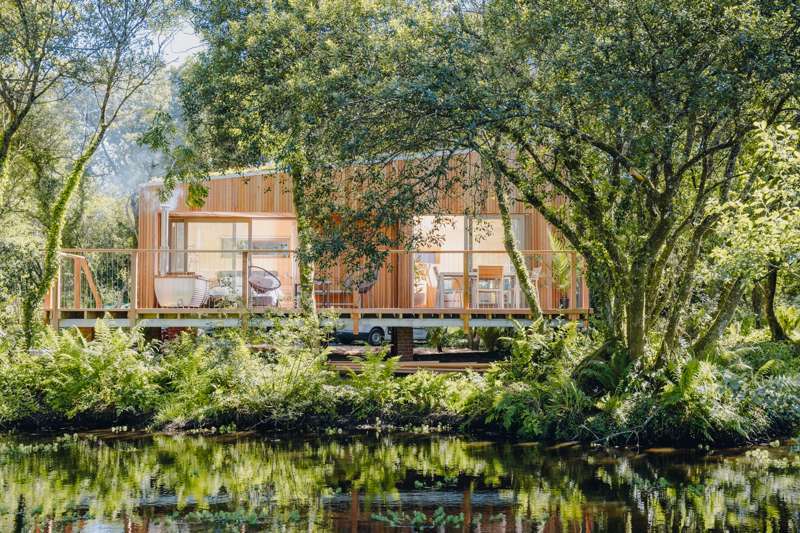 There’s glamping on the Roseland peninsula in the south and, at the extreme westerly point of the county and country, you’ll also find glamping sites near St Ives and Penzance. Switch to the map view on this page to spot the site that’s closest to the beach (or town or attraction) that you want to visit or try searching with a specific place name. 1. The Eden Project: one of Cornwall’s best-known attractions so hardly needs an introduction but just in case you missed the memo – it’s the only place in the world where you can see a rainforest growing inside a giant dome. 2. The Lost Gardens of Helligan: Cornwall’s own secret garden where 200 acres of beautiful gardens have been restored after years of neglect. 3. The South West Coast Path: the whole thing is 630 miles and takes in Devon and Somerset too so walking the whole route on a week-long holiday is an unrealistic aim but a short section still gives access to stunning scenery. 4. Land’s End: seems a shame not to when you’re out west! The westernmost point of England attracts plenty of people in the season all keen for a photo with the iconic sign (be warned: it’ll cost you) but beyond the tourist offering there are still lovely walks and stunning natural scenery. 5. St Ives: you can get your fill of heritage and culture by watching the fishing fleet at the town’s harbour and visiting galleries including the Tate St Ives and the Barbara Hepworth Museum and Sculpture Garden. 6. St Michael’s Mount: a fairy-tale church and priory built on a tidal island to honour the patron saint of fishermen, St Michael. 7. Bodmin Moor: recreate scenes from Cornwall’s most recent export, Poldark, out on the wilds of the moor. Lots of the action was filmed here apparently – and it’s also a pretty good place to walk and discover ancient landmarks too! 8. Tintagel Castle: Cornwall is a place of myth and legend and nowhere more so than at the cliff-top ruins of Tintagel Castle, linked to the legend of King Arthur and now managed by English Heritage. 9. The Lizard Peninsula: the most southerly point of the English mainland, and another place for a selfie! There are lovely beaches and hidden coves around the peninsula which are worth seeking out. 10. The Minnack Theatre: a theatre with a view! This theatre carved out of the rock has the sea as a backdrop. It’s worth a visit just to take a look – but better still if you can nab a ticket for a performance. 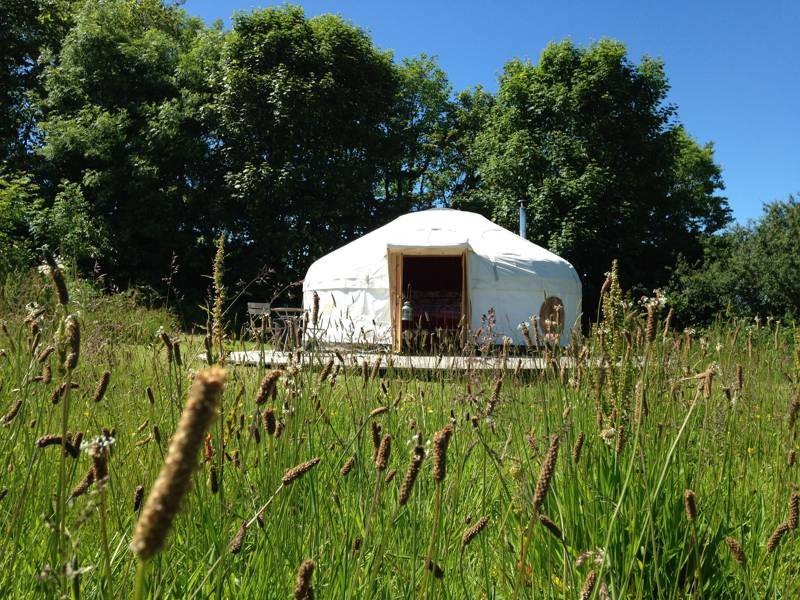 Glamping sites in Cornwall, glampsites in cornwall, glamping in cornwall, cornish glamping, cornish glampsites at Glamping in Cornwall, Glamping in Cornwall: Read glampsite reviews, check availability in Cornwall and book your glamping holiday at the best price.